DALLAS, TX (August 29, 2018) — Sendero Senior Manager Renita Joyce Garrett was recently named to the Dallas Regional Chamber’s 2019 Leadership Dallas Class. Founded in 1975, Leadership Dallas is a highly selective leadership development program aimed at providing the Dallas region with an ongoing source of diverse leaders who are prepared and committed to serve as catalysts and sustainers of positive change for the quality of life in the greater Dallas area. Up to 55 individuals are selected to participate in a 10-month educational program each year. Renita brings 15 years of consulting experience to Sendero. As a Senior Manager, she defines comprehensive solutions, develops plans, engages resources, and ensures optimal implementation for her clients. 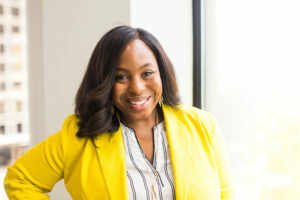 She currently serves as the President of the Chase’s Place Junior Board, Grant Writing Team Lead for the Junior League of Dallas, and a member of Alpha Kappa Alpha Sorority, Incorporated. She is a graduate of the University of Texas at Austin. To learn more about Leadership Dallas, visit the Dallas Regional Chamber website. Being stewards of our community is a cornerstone of our company vision. Our employees are service-oriented and display steadfast dedication to improving the communities where we work and live. DALLAS – Sendero Senior Partner Scott A. Miller has been appointed Chairman of the Board of Camp John Marc (CJM), a year-round therapeutic camp for Texas-area children with medical and physical challenges.